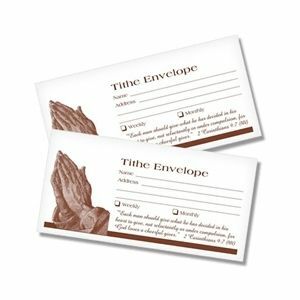 These offering envelopes are large enough that bills can be placed inside without needing to fold them. On the face of the envelope is a place for people to write their name and address and a Bible verse (2 Corinthians 9:7). 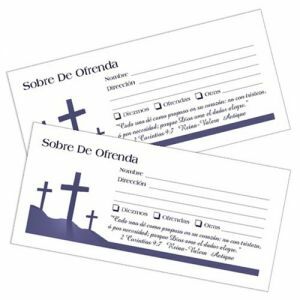 These are good offering envelopes to be used to collect weekly or special offerings. Offering Envelopes measure 6 1/2" x 3 5/8". Minimum order quantity is 50 envelopes. All writing on these envelopes will be in Spanish.